The status of each unit is constantly monitored and displayed as a green-for-go light on the underside, for instant monitoring of the entire system. Unlike previous standby-power systems each luminaire has independent backup power for a 3 hour duration, and automatically resets. We chose a Dyode LED 3 hour non maintained fitting being only 50mm diameter. 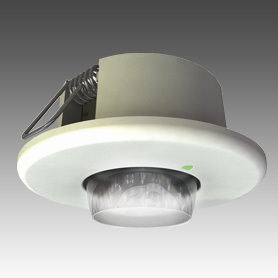 It is one of the smallest recessed LED fittings currently available. By utilizing a specially developed LED driver and advanced thermal engineering techniques to dramatically reduce the LED operating temperature the light output level from the LED is guaranteed throughout the full 3-hour emergency duration, ensuring the life of the LED exceed 50,000 hours. 5. Future maintenance made easy.